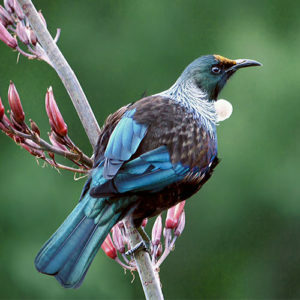 Tui are endemic to New Zealand, commonly found throughout New Zealand in forests, towns and on off-shore islands. They belong to the honeyeater family, and mainly feed on nectar from flowers of native plants. Often heard singing their beautiful melodies long before they are seen. Tui are important pollinators of many native trees and will fly large distances, especially during winter for their favourite foods. These birds are quite aggressive, and will chase other Tui and birds away from good food sources. Tui have two voice boxes and have an amazing range of sounds that can include bell-like tones similar to the bellbird, plus clicks, cackles and coughs. They are also great mimics, and copy other birds as well as phones ringing and car alarms. Tui became popular with Maori and early settlers because of this talent and were taught to talk and whistle particular tunes. Maori stories tell that Tui trained so well they could welcome people to a marae! Check out this video of a Tui that mimics his keeper. Learn more about the conservation at Canopy Tours here.